With more than 30 years of sports broadcasting behind him, Ray (Rabbit’s) Warren is one of the most experienced callers in the game. Born in Junee, in NSW’s Riverina district, the son of a railway worker, Ray had always dreamed of being a sports broadcaster. From the age of six Ray honed his broadcasting skills rolling marbles down a hill and calling the event as if it was a horse race or sitting in the trees around the local oval and calling the rugby league games. After saving up enough money, Ray invested in a tape recorder and would sit on the roof of the grandstand and call local footy matches. At the age of 23, Ray Warren’s professional broadcasting career began at radio 2LF, in Young, part of the Macquarie network. After two years at 2LF, Ray’s natural talent and desire was recognised when he was moved to the Macquarie network’s flagship station 2GB in Sydney in 1969. It was at 2GB that Ray Warren achieved his childhood dream when he worked as understudy to his hero, “gun” race caller Ken Howard. Ray soon added rugby league to his repertoire. In 1974, rugby league became the dominant sport in Ray’s life when he was picked up by the Ten Network to call the Amco Cup. For 13 years Ray called all the games in the Amco Cup, Winfield Cup and Test matches and along the way reached another lifelong ambition of calling the Melbourne Cup, three in total. In 1986, Ray left the Ten Network and went back to calling the races, before the Nine Network asked him to part of their 1990 Commonwealth Games commentary team. Ray Warren, alongside Norman May, called the swimming events and witnessed the “Princess of the Pool”, Hayley Lewis pick up six gold medals and the unearthing of future swimming superstar, Kieran Perkins. 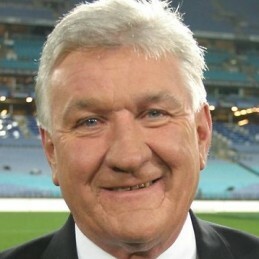 At the end of 1991, Ray moved to the Nine Network full-time to become head rugby league commentator. In 1996, Ray was also a regular panellist on The Sunday Footy Show. As well as his league commitments with Nine, Ray Warren has also called the 1998 Telstra Commonwealth Games Swimming Trials and was a member of the Network’s commentary team for the 1998 Commonwealth Games in Kuala Lumpur. In 1999 Ray called the World Short Course Swimming Championships in Hong Kong and in August that year anchored Nine’s commentary team for the Pan Pacific Swimming Championships in Sydney.